Announcement As my family prepares to welcome our second baby boy, house and venue portraits will be closed until the beginning of May. Follow my Instagram page for @thelighthousesketchbook for updates, giveaways, and a behind the scenes look! As my family prepares to welcome our second baby boy, house and venue portraits will be closed until the beginning of May. This was an anniversary present for my husband and we are moving in a couple months, so it was a very thought out present and it did not disappoint! I unwrapped the picture and it brought tears to my eyes of how accurate and detailed it is. Now I will always be able to remember our first home! Thanks so much!! Just received my finished painting of my boyfriend’s house and it’s beautiful! I can’t wait to go out tomorrow to pick out the perfect matting and frame! He will just love this surprise for his birthday this coming June. My love of art and creating has always been a part of my life and I was truly blessed that my family continuously encouraged me to be artistic. The first time I remember feeling like a real artist was when I received a professional sketchbook for Christmas at 9 years old – hence the name, The Lighthouse Sketchbook! Although I always said I wanted to be an art teacher, I ultimately decided to pursue a degree in Communications and minor in Art History instead. I continued to paint and draw, but as life got busy after graduation, my art started to take a back seat & eventually I began to feel like a part of me was missing – so a few years ago, I made a decision to dedicate more time doing what I love - creating, painting, & drawing! The moment I rediscovered watercolors (a medium I hadn’t used since high school!) I was completely hooked! That decision and commitment became life-changing. I still work full time as an educator for a local non-profit organization, but when I am home and not taking care of my little baby boy or spending time with my husband, my hours are filled with painting and relaxing in my small studio. I truly love creating paintings for other people and opening an Etsy shop to share my love of art has been a dream of mine for several years, so I’m excited to finally be a part of this wonderful community! I hope you enjoy exploring my shop! 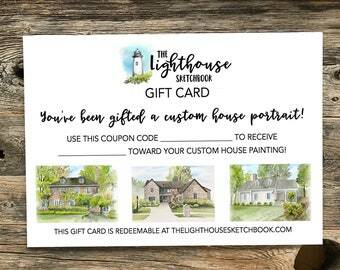 Be sure to follow me on Instagram @thelighthousesketchbook to see more behind the scenes photos, discounts, giveaways and tutorials! My turn around time varies for each listing. Please check the listing & shipping details. For house portraits, my turn around time changes depending on how many orders I have at the moment. I will always update the listing & try to add a message in my shop announcement. For my house portrait, do you send me pics throughout the process? In an effort to get your painting to you as soon as possible, I typically complete your painting in one sitting & then ship it out shortly after. I don't typically send photos during the process, but if you'd like me to keep you updated, just let me know and I would be happy to accommodate! Do you offer a discount if I order multiple house portraits at one time? Yes! If you plan to order 2 or more paintings at once, message me about a coupon code I can offer you! I'm a real estate agent & plan to order several house portraits from you as gifts for my clients. I won't be purchasing them all at one time, but can I still get a discount? Yes! After the purchase of your second house, you'll become a Valued Customer! I'll include a coupon code for 10% off all future house portrait orders! This applies to ANYONE who orders 2 or more separate house portraits. The Lighthouse Sketchbook is not responsible for lost, damaged, or stolen packages. Delayed scanning by USPS is beyond our control once the package leaves our premises. Please allow 48 hours for USPS to update their tracking. The only photo I have of the house I want painted was taken in the winter. Can you add greenery to the leaves and bushes? Absolutely! I’m happy to green up any trees or bushes so your painting looks a little brighter and full. Just let me know when you make your purchase. Can you use photos from Zillow, Googlemaps or another online site? Yes! I’ve done this many times! I would advise you send me the photo before you make your purchase, so that I can make sure it is something I’m able to work from. It’s also important to let me know additional details (such as the color of the house, shutters and doors) as those are often difficult to make out in online or low quality photographs. Can you add a pet to my house portrait?